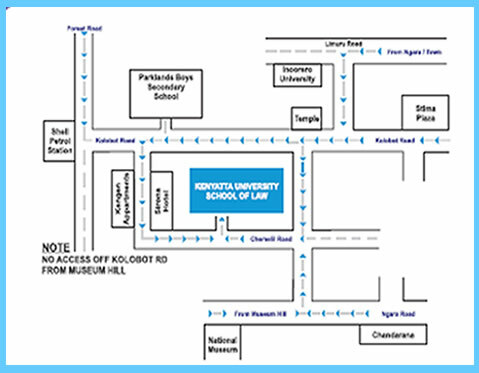 Kenyatta University School of Law [KUSOL] is housed in the Parklands Campus of Kenyatta University. It is located in the idyllic suburbs of the City of Nairobi in Parklands on Chemelil Road off Kolobot Road. It is also near Stima Plaza and adjacent to Sirona Hotel and can be approached from Kipande, Limuru, or Forest Roads. The Location of the School not only provides a serene and secure environment conducive for learning and living, but it is also easily accessible both by public and private means given its close proximity to Nairobi’s Central Business District.